The Online RN-BSN program provides students who are already Registered Nurses (RNs) the opportunity for educational and professional advancement. This program is designed to meet the needs of working registered nurses and allows them to explore new perspectives by learning with other nurses. Students are able to apply real-world solutions in their current positions immediately. 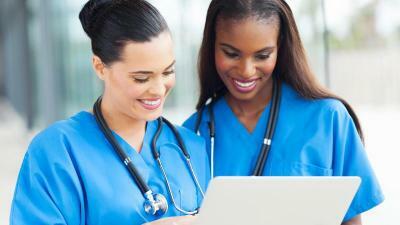 The Online RN-BSN program’s core curriculum, comprised of 26 units, equips students with the knowledge and skills needed to engage in critical thinking and to become creative problem solvers who are culturally aware and committed to resolving health disparities within a research perspective. The nine core courses provide students with the ability to view the complexity of issues that are often experienced by our diverse community. The Community Health Theory and clinical courses provide the framework to acquire a deeper understanding of the practice components needed to effectively collaborate with individuals, families, organizations, and communities. The online format makes course lecture, readings, assignments, and communication with instructors and classmates accessible to students 24/7 via the highly developed and user-friendly Blackboard course management system. Online courses are identical to face-to-face courses in terms of course learning outcomes. The Online RN-BSN program, like the traditional on-campus program, is designed in a sequential cohort-based model; the courses will be delivered in 10 week sessions. The program is designed to be completed in one year. Although the majority of the program will be provided online, students will meet face-to-face during the initial orientation, final health assessment check off, and for community health clinicals (90 hours).